In the mood for a vacation this year? There are plenty of great places to go if you’re looking for some sunshine, and Australia is one of the best. It’s an ideal destination if you want somewhere warm to spend the time considered to be winter in the Northern Hemisphere, although the weather Down Under is pretty great all year round. 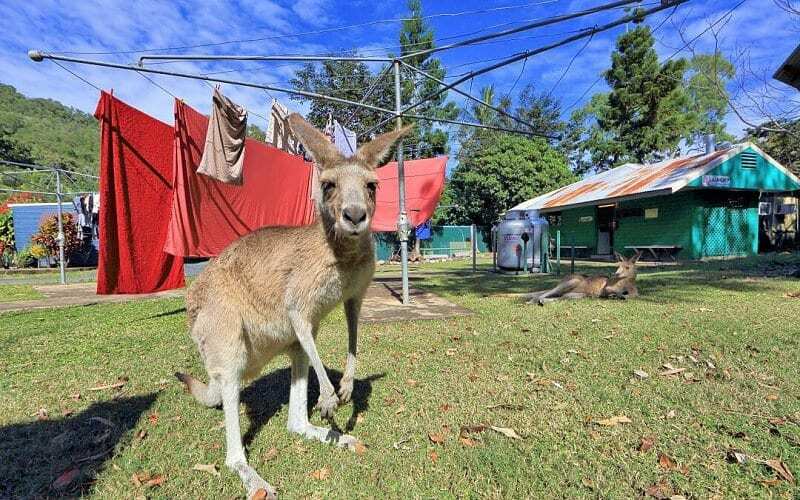 It’s very rare that you’ll be disappointed by an Australian vacation. However, while sunny days at the beaches are par for the course, you’ll be in for a lot more than just some summer fun. No country is without its share of dangers, but Australia can be pretty lethal when it wants to be. The variety of wildlife that lives in this country is definitely diverse, which is both a blessing and a curse. Yes, you’ll encounter things that you won’t see anywhere else, but not all the creatures you meet will be friendly. There are some truly terrifying things out there, from giant spiders and snakes to lethal birds and jellyfish. You’ll be taking your life in your own hands if you visit Australia, but that just makes the vacation more exciting. If you want an idea of what to expect in the country, these photos should give you a good idea. It’s a mix of summer paradise and death trap, which may or may not sound appealing. You’d certainly have a unique experience in Australia, but we’ll leave you to decide whether that’s a good thing or not. When you think of Australia, you probably think of sun, sea and sand. The country is definitely one of the best places to visit to enjoy a summer at the beach, especially if you love taking to the water. It’s well-known as a surfer’s paradise, and there aren’t many places better for riding the waves. Social media star and professional surfer Ellie-Jean Coffey has found that there’s nowhere more suited for her talents than the land Down Under. She and her family travel all over Australia to get the best of what the country has to offer, and she loves every minute of it. We would too if we got to hit the water all the time. Unfortunately, Australia isn’t all about gorgeous weather and beautiful beaches. For every great surfing opportunity, there’s a terrifying monster lurking around the corner. Are you a fan of spiders? If the answer is a resounding no, then seeing this brute would probably scare you to death. 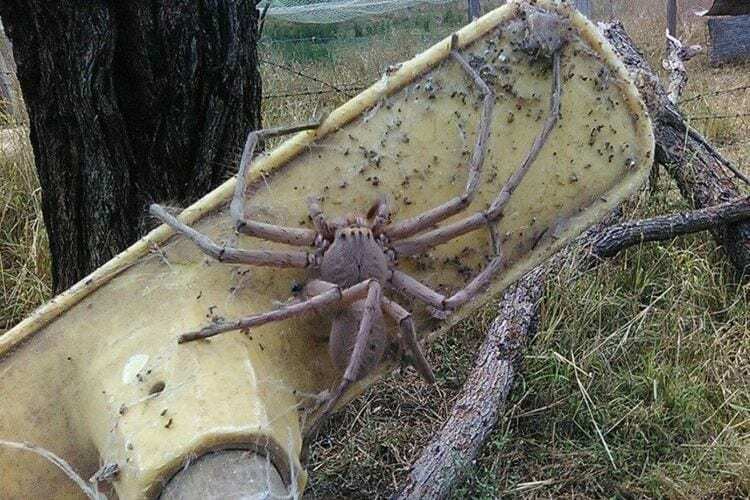 Huntsman spiders are unfortunately not a rarity in Australia, and they’re as horrific as they look: they can be deadly and prone to attack, although this creature is considered to be a gentle soul. The person who saved it said that the spider means no harm, although we wouldn’t be willing to get too close to find out. We’re freaked out just looking at a picture of it. It’s not just spiders that are found in Australia. Snakes are also common, and can apparently crop up in the most surprising places. 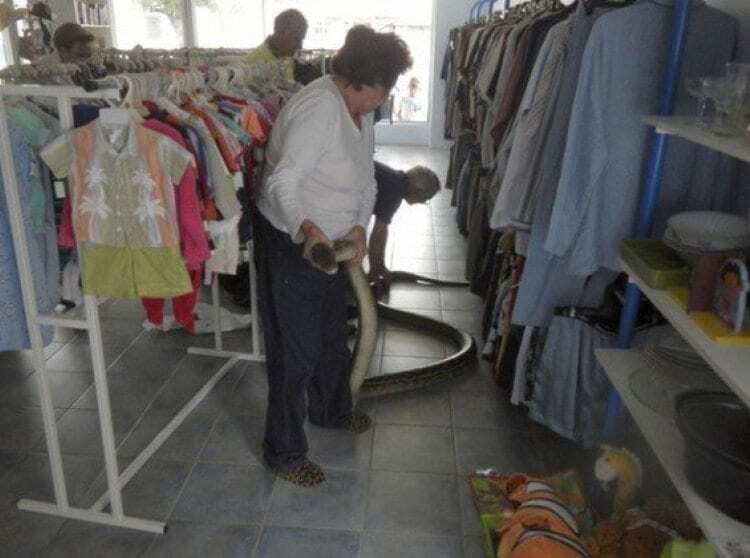 This one, in particular, was obviously hoping to do some clothes shopping at a thrift store, but the other customers weren’t too pleased by its presence. You can tell these people are locals by the fact they’re not afraid of picking up this giant reptile. When you live in Australia, you have to learn to live without fear. Otherwise, you’ll never leave the house. 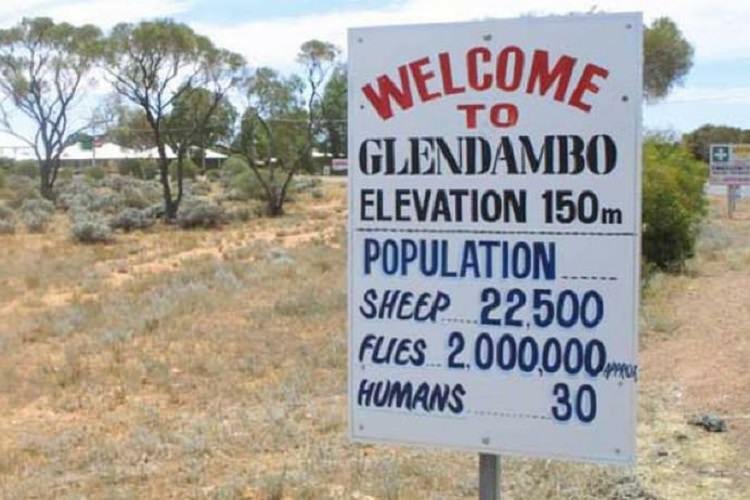 Usually, when a sign welcomes you somewhere, it tells you what the average population of the area is. In Australia, things are a little different. Sure, the sign lets you know who lives there, but it doesn’t just take humans into account. We’re not sure if those 30 residents put these figures on here as a deterrent to tourists, because if we saw this, we’d turn around and leave. Two million flies? That sounds like something out of a horror film. We’d rather take our chances somewhere else, thank you. Once you enter Australia, there’s no leaving. At least, that’s what this alligator thinks. 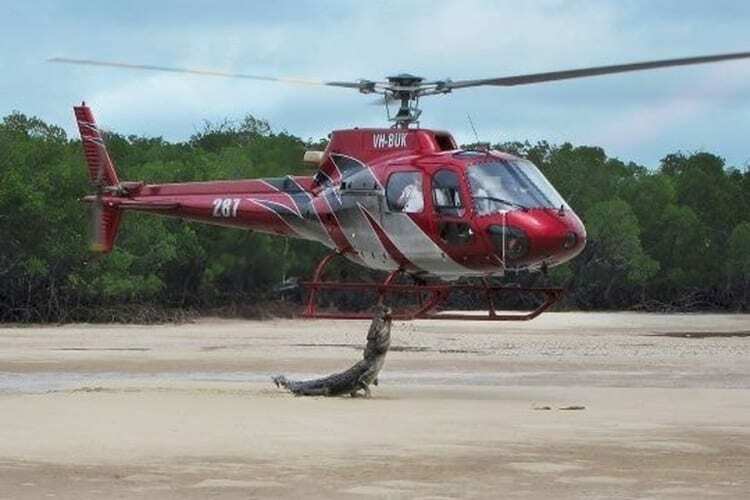 These people believed they were safe to flee in a helicopter, but the reptile had other ideas. As soon as he saw the vehicle try taking off, he grabbed onto it and held on with all his strength. We’re not sure who’d win in a fight between the two, but we’ve seen how strong the Australian wildlife can be. We’d put our money on the alligator, though this one looks like it could use some help. Still, Australia isn’t all about scary creatures that could take you down easily. When you’re not being plagued by the wildlife, the country is actually a beautiful place to explore. If you’re in the area, don’t be afraid to grab your board and hit the water. There’s so much to see, especially beneath the surface. Even if you’re not the best surfer and regularly crash out on the waves, you can still have a great time out on the water. Just remember that once you’ve enjoyed your time surfing, there’s probably something terrifying waiting to surprise you back at your place. Like this, for instance. 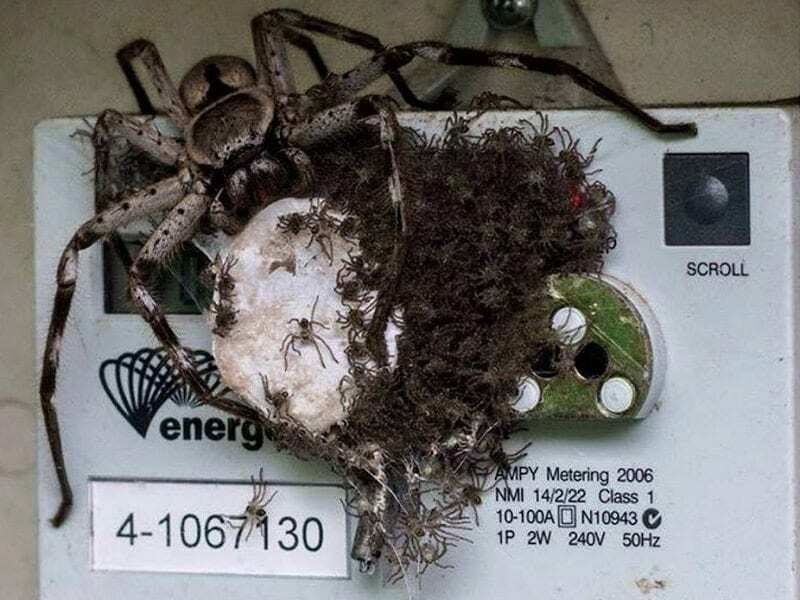 You might have a bit of trouble taking meter readings with this beast taking up residence here. Can you imagine even trying to move it out of the way, let alone all its babies? This is giving us flashbacks to the Forbidden Forest in “Harry Potter and the Chamber of Secrets” and we’re not too happy about that. Our PTSD is flaring up. While that might not be something too pleasant to find in your house, this is a little more comforting. Kangaroos are definitely one of the cuter animals local to Australia, even if they do pack a punch (and a kick, too). There are certainly worse things to find roaming around in your backyard, especially in this country. We could spend hours just watching them do their thing, even if that’s just chilling in the sunshine. Now, how do we go about getting one as a pet? It’s not just people’s backyards that these cute animals like to explore. Just like everything else in Australia, you can find kangaroos pretty much everywhere, including at the beach. 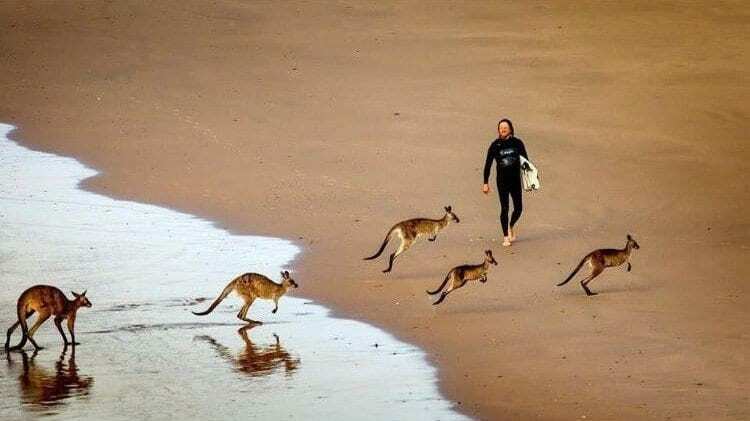 We wouldn’t mind going for an early morning surf to see some kangaroos bouncing around in the water. We’re not sure how good they’d be on a surfboard, but they’d probably have more skill than us. Why don’t we ever get any kangaroos on beaches over here? They’d make going to the coast so much more exciting. There are so many terrifying creatures in Australia, but thankfully humans aren’t their only target. The rules of the wildlife seem to be that anything’s prey, no matter their size. Unfortunately, some beasts are naturally designed to be superior, no matter how good a fight other animals put up. 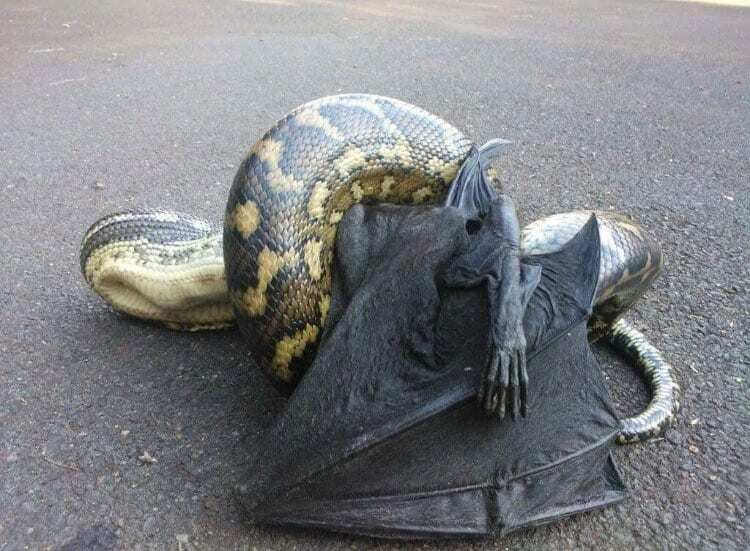 It’s safe to say that this snake has come out victorious here against this flying fox. For all the bat’s efforts, few things can win when facing a creature like this. Remember that people. Apparently, someone invited this lizard to a surprise party, and this is their way of hiding. It’s not a bad spot, although they obviously forget anyone coming into the house could see them. 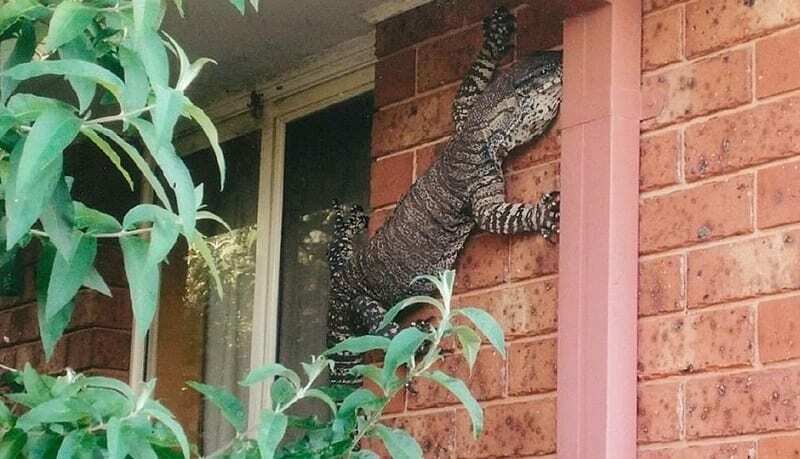 It’s not every day that you see a five-foot reptile scaling your walls, although this is Australia we’re talking about here. Clearly anything is possible when it comes to their wildlife. We should just be glad it’s content to sit there and not bother anyone… for now. There’s a good reason why millions of people flock to Australia for a beach vacation every year. If you’re into surfing, the country offers some of the best waves you’ll find anywhere in the world. Where better to take up the sport and hone your skills than here? Even if you’ve never jumped on a board before, you can get the hang of things pretty quickly. Plus, with such great weather a lot of the year, you can always just lounge on the beach after failing one too many times. This scene of a cassowary escorting its young across the road would be cute if it weren’t for the fact that the bird is one of the most deadly animals in Australia. Even though they look harmless, these birds can grow to sizes of over 6 feet, which is higher than most humans. Their feet are also incredibly deadly weapons, with sharp claws that can inflict fatal injuries. This is particularly scary seeing as a cassowary can run at speeds of 30mph, so escaping them is not an option. There’s so much about this photo that’s too adorable for words. It almost makes all the scary creatures in Australia worth it just for the chance to see something like this. 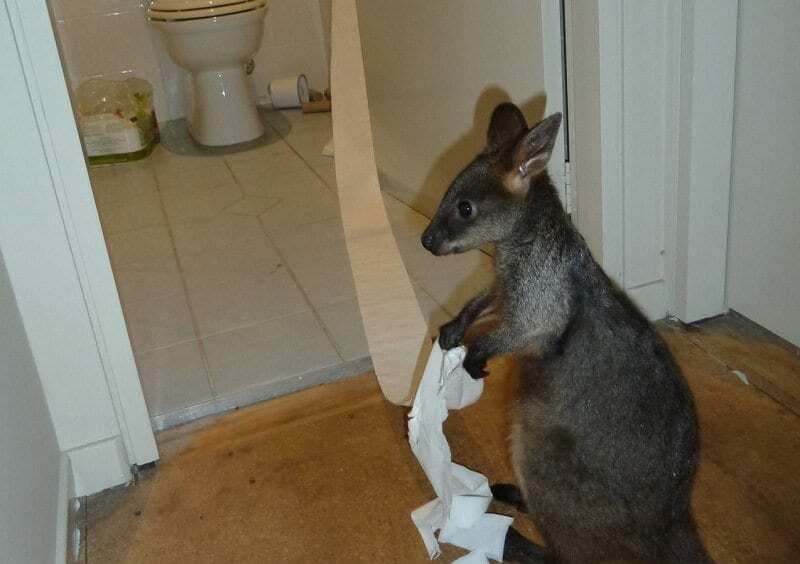 This troublemaker clearly has an affinity for toilet paper, but it’s the look on its face that we can’t get enough of. It’s the ‘if I don’t move, no-one can see me’ look that we’ve definitely pulled out on several occasions. They know they’ve done something mischievous, but they have no regrets. As one of the premier surfing destinations in the world, it’s unsurprising that Australia is home to some of the biggest stars in the sport. One of those is Stephanie Gilmore, a woman who’s won the ASP World Tour six times. In 2017, she earned almost $250,000 thanks to her ability on the water, and it doesn’t look like her skill will be waning anytime soon. Let’s hope her iconic status convinces more women to take up surfing and prove that what men can do, they can do better. You really have to wonder if anywhere in Australia is truly safe. 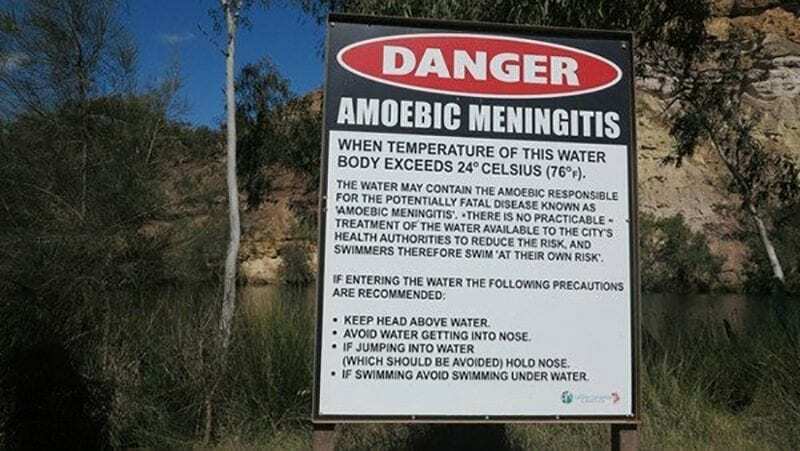 Even freshwater ponds pose a significant risk of death because of amoebic meningitis. Given that there’s a 3% survival rate with this disease, we think we’ll follow these warnings. We have to wonder if any other country has as many caution signs around as Australia does, because there seems to be danger everywhere you look here. Suddenly never leaving the house doesn’t seem like such a bad idea. Who needs a social life anyway? It’s not just freshwater that you need to be afraid of, though. 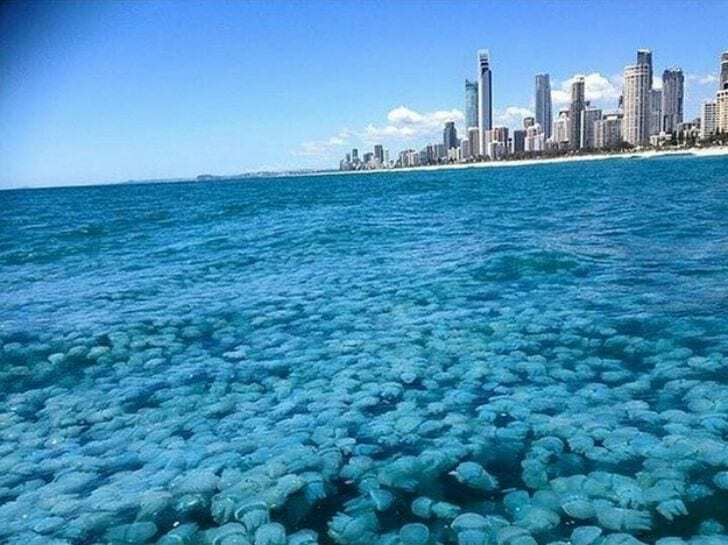 Yes, those are jellyfish. Lots and lots of jellyfish. If you thought sharks were the only thing you had to fear in the ocean, think again. Australia is home to many of these aquatic creatures, including some of the deadliest around. In the north of the country, you’re at risk of encountering the Irukandji jellyfish, not that you’d notice. It’s only one cubic centimeter in size, but it’s one of the most venomous species you’ll ever meet. While the ocean may well be teeming with deadly critters, not everything that lives underwater is quite so scary. In fact, some of the most harmonious animals live down in the depths, and you’re sure to see more than a few if you go out surfing. Admittedly, they might get scared off if you get wiped out while on your board, but some are probably used to the antics of surfers by now. You never know what wonders you’ll see until you go out there yourself. Seriously, we want a kangaroo so badly. As if we didn’t already love them enough, this has sent us into overdrive. How cozy does this little cutie look? We would gladly have one of these as a pet to put to sleep every night. 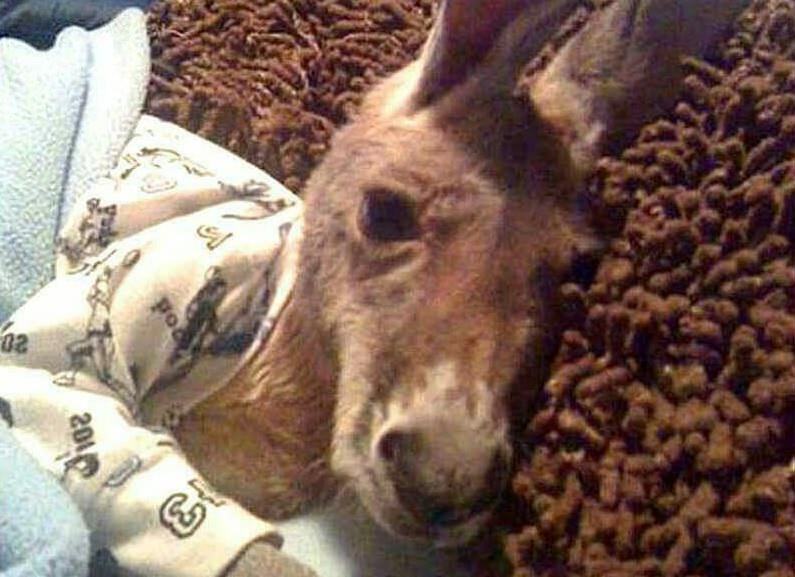 We’re not sure what lucky Aussie was able to find a kangaroo so receptive to being put in pajamas and tucked up in bed, but we’re incredibly jealous of them. Is this just standard behavior over in Australia? Australia really is a beach lover’s paradise. It’s the perfect place to go on vacation with your friends if you’re searching for adventure. While there still seems to be danger everywhere you look, the beaches certainly appear to be one of the safer spots to spend your time. You’d never find us complaining about that. Spending all our time in the sun riding the waves and topping up our tans… where do we sign up? We couldn’t think of anywhere better to be right now. Will driverless cars take over the roads?